This Movie Monday choice was unexpected. 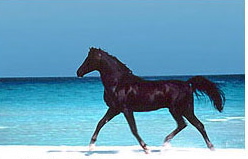 The kids and I were actually just watching The Black Stallion the other night, when I remarked about how pretty the beaches in the film were. Lo and behold, the credits rolled by, and the beach and island scenes were filmed in Sardinia. Ta-da! . . . another Movie Monday recommendation with just a little bit of European scenery to whet your family's appetite for travel. It's a good story whether the Sardinian beaches entice you there or not. 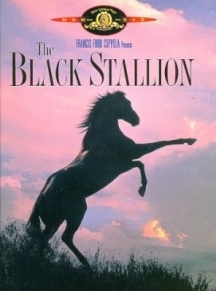 The 1979 Disney film based on Walter Farley 's classic book of the same name is about the bond between a young boy and a black Arabian, stranded on an island together after a shipwreck. After being rescued and taken to America, the boy is trained to ride and soon the two are challenging champion racehorses. The visuals in the film are quite beautiful and the soundtrack is moving. Definitely one for the whole family to enjoy. I loved this movie as a kid - and I am sure my 11 year old would took - thanks!